Table Connect for iPhone: First mock-ups of the final table! First mock-ups of the final table! 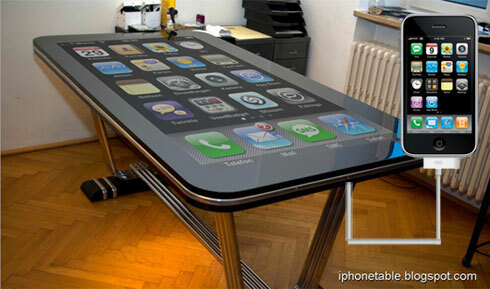 While others show off only concept renderings, we are about to put the final touches on the "iPhone Table" prototype. Table Connect for iPhone is what you have been waiting for, multitouch on steroids! For now, we start with mock-ups as well. Currently, we are finishing up the work on the alpha release software for the table. The iPhone is attached via the standard dock connector – immediately after it is attached, the magic starts to happen. The entire content of the iPhone’s screen will be projected onto the multitouch table, still giving full access to all the touch gestures using multitouch technology. Check back often in the coming days as we will post demos and news on the final development of Table Connect for iPhone. haha those photofakes look hideous! We stated above that these are mock-ups. Don't worry, it's not long until the real prototype will be shown in a video. Photos are fake - reflection of the window is on the wrong side of the room! Window is behind the photograph. Hello Jan - happy you like our concept. As mentioned before, these photos are mock-ups to illustrate the idea. Yes they are "fake" if you want. Don´t miss the video demo next week! Very cool! 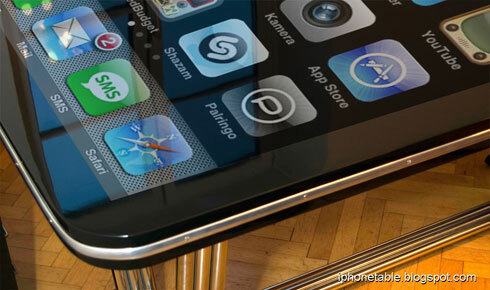 How do you mirror the iPhone screen? Do you need to run special software on the phone? Hi Paulo & Francesca - yes, it's an app that will be available on Cydia. More on that in the video demo, check back in a few days! This is going to be a cracking device. Business to gaming can benefit from this concept and it is so economical and simple comparing to the similar solutions available. Wish you all the best and hope to see the product in the market soon. iPod Touch 3 & 4? Do they work? can you make a small size?? example..., 11inch..
Where did you get the 58" full-HD capacitive LED touchscreen from? lol. i'd buy one for sure, great coffee table! We 100% support what you are doing. Great work and keep up the innovation. We look forward to the next stages of the project. I hope you don't mind, we did a feature on you for our website. Nice posting at blogspot blog i like to do commenting here. Really this is very nice collection..these all pics is looking very nice..beautiful post.. I agree with your post. Very good writting. i am glad to find the post. This is awesome technology by Apple and I would like to buy it. Thanks for presented here. i,ve fall in wonderfull problem.Today saw one cellphone dealer thats offer Free iPhone and iPad here this website for apply. If anybody get iphone,ipad from they please tell me.Its only for all us offer!! Sign Up And Start Earning Now !! I,m synthia live in newyork.Today saw one cellphone dealer thats offer Free iPhone and iPad here this website for apply.